A 22 mile ride all round the boundary of Camden starting from the Town hall in Judd Street. A map of the route shown here on Google maps. A link to news items about each of the rides from 2007-14 and a route description is here. This popular 18 mile route starting from the Highgate Road entrance to the Hampstead Heath cycleway has been led by John Chamberlain about half a dozen times. See the route on GPSies here or Google Maps here An account of one of these rides in 2012 is here, and another in 2014 is here and another in 2009 is here. This is popular 26 mile route strating from the Interchange Centre Belsize Park has been led by James Brander on many different occasions. See the route on GPSies. An account of one of these rides in 2011 is here. An account of another ride in 2008 is here. This 10 mile route starting from West Hampstead takes in Gladstone Park, Roundwood Park and Queens Park and was designed by Geoff Stilwell. See the route on Strava. Read an account of the ride in Summer 2014 here. A 12 mile circular route in Camden, starting from West Hampstead and taking in the ice cream parlours in Camden including Golders Hill Park cafe, Marine Ices Haverstock Hill and the Garden cafe in Regents Park.Designed by Alix Stredwick in 2004 and re-designed by Geoff Stilwell in 2014. Tested in 2004 by two groups of eight women. See map of the route as ridden in 2014 on Google maps and the variant ridden in 2015 on Google maps. Here are accounts of the ride in 2004 and in 2014 and in Ice Cream ride 2015. A 15 mile circular route in Camden, starting from West Hampstead, going via Maida Vale and Paddington Basin to Kensington Palace and Hyde Park with Buckingham Palace and St James’ Park added. Designed by Geoff Stilwell who lead a ride on this route on 9th April 2016. See and account here and see the route on Google maps here. A 9 mile, family-friendly afternoon ride from Sidings Community Centre to Regents Park and back along the Regents Canal. Designed by Geoff Stilwell who lead a ride on this route on Sunday 28th February 2016. See an account of the ride here and see the route on Google maps here. A 12 mile circular ride starting from Castlehaven Community Centre and introducing some quiet routes. A map of the route designed by Jean Dollimore is shown here on Google Maps. Plus suggested extensions to Olympic Park and back (about 16 miles total). See a trace on gpsies of a 15 mile circular ride through Victoria Park to the Olympic Park (returning via the canal towpath). The anti-clockwise direction is recommended so that the up-hills come on low-traffic portions of the route. The most aerobic climb is up the idylic Fitzroy Park – a private road, but with an apparent right of way. Climbing the hill on North End Way is the only spot where traffic can be slightly annoying. a 9 mile route (climbing ~ 200 metres) round Hampstead Heath, here. a 12 mile route involving circuits round both Hampstead Heath and Regents Park, here. We usually take the train from St Pancras, Kentish Town or West Hampstead to St Albans or Harpenden stations (Elstree and Radlett are also possibilities). Ride north via Ayot St Lawrence, Kimpston and Whitewell for example. A popular lunch spot is Emily’s Tea Rooms in Whitwell. As an example, the route shown here describes a 26 mile ride from St Albans to Harpenden via Whitwell. St Albans Station: The NCN 61 route passes very close by: on leaving the station turn left onto the main road (Victoria Street) then second right onto Flora Grove and left again to find a track linking to the off-road cycle route (on a disused railway track). This provides access to several possible routes. For example the ride from St Albans to Harlington below uses the NCN 61 route, then turns north via Wheathampstead to head towards Emily’s Tea Room. 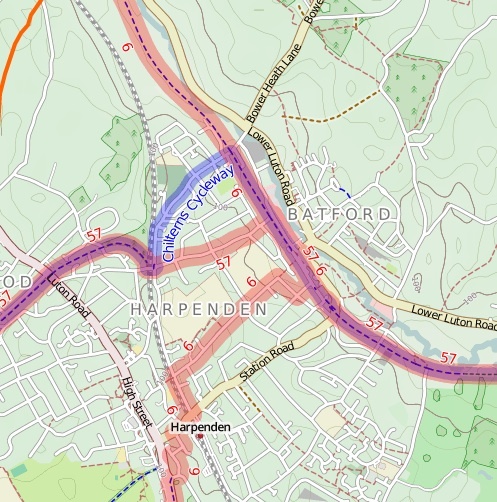 Harpenden Station: for the routes around Ayot St Lawrence leave the station in a north-easterly direction, go down the hill to the Lea valley and then up the hill on the other side towards Kimpton (via Bowers Heath Lane). You may be able to make use of NCN 57 (Chilterns Cycleway) that runs along the Lea Valley. a circular ride from Harpenden with lunch stop at the Raven in Hexton and tea stop at the Brocket Arms at Ayot St Lawrence. See an account. a ride from Harpenden to Harlington via Emily’s Tea Room in Whitwell. See an account of the ride in 2008.
a 30 mile ride from Harpenden to Radlett via Emily’s Tea Room in Whitwell. See the route on a map (on gpsies). And see an account of a ride on the route in 2011.
a 30 mile ride from Harpenden – Elstree via Whitwell. See the route on gpsies. a 50 km ride from St Albans to Harlington with lunch at Emily’s . See a map of the route of the ride on Central London CTC website. See also an account of a ride on this route in 2009.
a 40 mile ride from St. Albans – Hertford and back (mainly on Sustrans routes). It starts from St Albans Station and quickly joins theNCN 61 off-road route to Hatfield before branching off to Colney Heath, Welney Green and Broxbourn. There it joins the River Lee towpath which continues to Hertford. 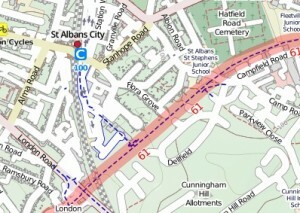 We then rejoin the Sustrans route which takes us all the way back to St. Albans. Route Map here. a 25 mile circular ride from Chesham via Little Gaddeston with a lunch stop at the Tea Room on Pittstone Common. The route is on gpsies. a 27 mile circular route starting from Hemel Hempstead (using Euston Station) with the same lunch stop the Tea Room on Pittstone Common. The route is on gpsies. a hilly 90 km ride circular ride from Amersham, following an Audax route. Route map here. Train-assisted ride from Richmond back to Kilburn/West Hampstead through Syon Park, Osterley Park, Gunnersbury Park and two short sections of the Grand Union Canal. Designed by Geoff Stilwell who lead a ride on this route on Sunday 4th October 2015. See an account of the ride here and see the route on Google maps here. This book, published in 2013 is an excellent source for suggestions of rides to be done in the country not far from London and easily accessible by a short train journey. The book is beautifully illustrated with photos and contains about 30 very well-researched routes, with a sketch map of each ride as well as a description of points of interest and places to stop for refreshments. If you own a copy of the book, you can download an OS map page and GPX data for each route.